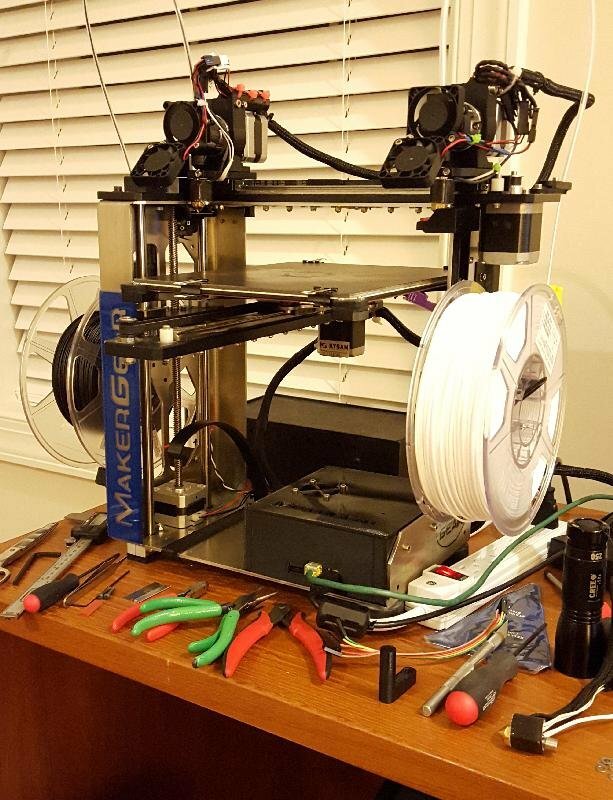 Many dual extruder 3D printers, including the MakerGear M2 with the dual extruder upgrade, put two hot-ends together in the same monolithic assembly, side-by-side. This has the advantage of avoiding issues with offset calibration: The extruder nozzles are held in exact relationship to each other by being mounted into precisely drilled holes in the same mounting bracket. The serious drawback of this arrangement is that when printing, the inactive hot-end will drip all over the print. This problem can be alleviated by the use of "ooze shields" and "wipe towers", and it's a minimal problem when using less drippy plastics like PLA, but they don't completely solve the problem (plus ooze shields and wipe towers waste a lot of plastic, as well). This project is an attempt to resolve many of the usual dual extrusion issues using a different architecture with two semi-independent single extruders instead of the single dual-extrusion assembly. I call this the "twin extruder" as opposed to the name "dual extruder", because the extruders are really twins, working together to make a two-color or two-material print. This is a large and involved project, so click on the photo below to take you to the project page.